Hi guys, writing a description while half-sleep is not a useful skill to have! So here we go again, Foxtrot is the culmination of several years of mapmaking, where i have been making standard maps and moving from there pushing the boundaries ever so slowly. The map the map is riddled with several sweet spots where players can take advantage of the map, but this works both ways as always, allowing smart players to counter with his own little annoyance. The complex layout of the map rewards the player that can recognize the terrain and take advantage of it, and the many spots where players can hide harassing units allows for heavy use of multi-pronged attacks. ◙ 3-in-1 map with vertical spawns disabled. 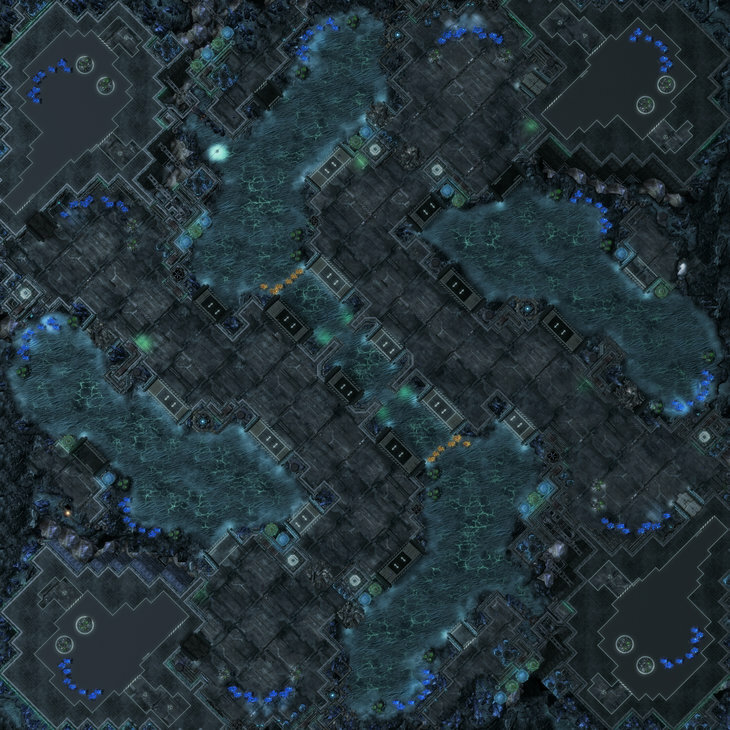 ◙ The center of the map allows for a wide variety of attack routes and diverse positional challenges. ◙ Central gold bases are extremely exposed but they give a good income for those players that adapt to the map and are able to defend them. Changed lighting of the map given the feedback. Minor aesthetic changes, added pipes to the overlord pods around the map. 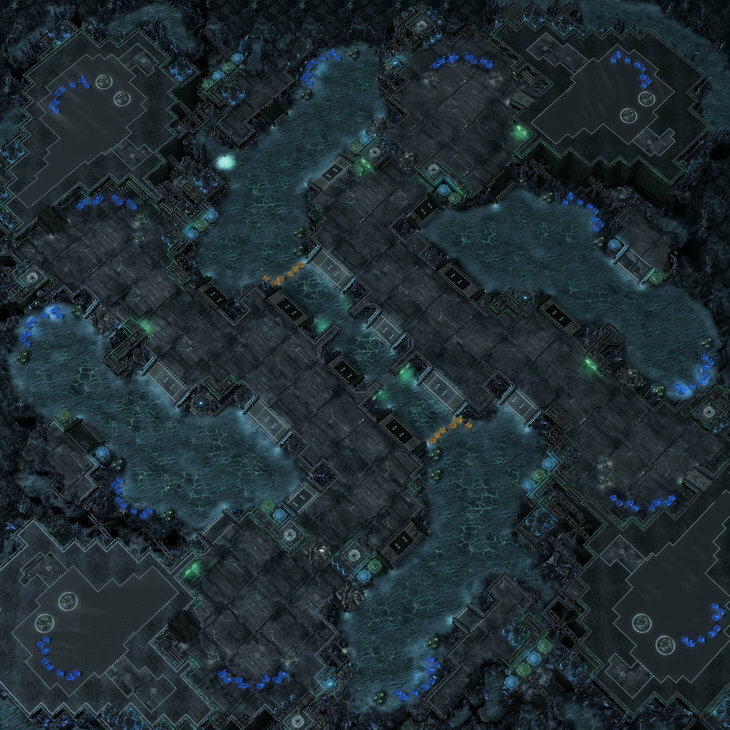 Minor changes to the top right and bottom left natural bases to avoid a very very ugly cannon rush. Expanded the unpathable area around the natural bases at NE and SW bases so siege tanks can't shell more than 1 mineral field and 1 Vespene geyser. Added destructible plates behind the mineral lines at NE and SW natural bases to avoid cannon rushes. Map Submitted to the TLMC#4. Not anymore, KTV Foxtrot Labs v1.0 was removed to avoid confusion, there is enough as it is with Blizz using a outdated version. As always the newest and latest version can be found in the custom games section! the map's layout was discussed in other threads. so i want to focus my criticism on stylistic decisions and arts/crafts. for me the stones with glowing cracks below a sand texture do not work. visually the effect looks like a bad photoshop layering of different textures. craft-wise it looks like an unelaborated idea to make stuff look different, but it does not make that much sense really. the cracked stone with the greenish glowing cracks has the appearance of a flat surface- the details are in the lower cracks, the cracks present the big structure within that texture. on the other hand the the sand has an overall high detail degree, it is grainy everywhere and has a dune like structure - both do not mix very well when used on a large surface. they would work much better with sand in one region, a third texture for blending and then the cracks. I never made a thread for this or Kamala in the first place, glad you liked the map Kappa. and to use custom textures to get those cracks to show without the need to use extra textures, but the TLMC arrived and i had to choose fast between, use another one or to use it with some tweaks b/c no custom textures are allowed in the TLMC, at the end i chose the later, and after seeing all the reactions i'm not sure if i did the right one, but i'm happy with how it came out given that at the time i was really pressured about studying for the exam period that was getting closer. 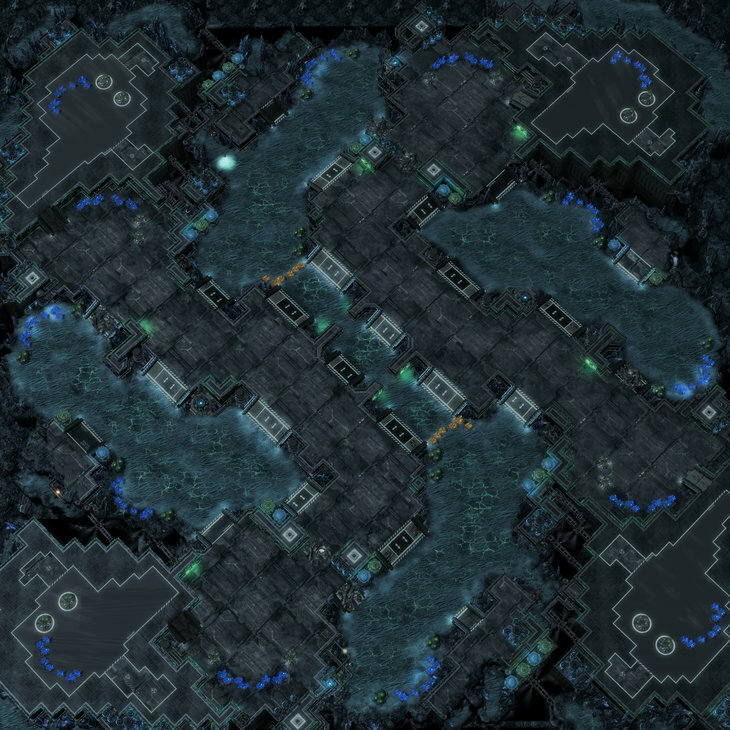 This map should have won TLMC. Hopefully it gets picked up and get some games played on it though, you definitely deserve it! Only thing I somewhat dislike about it is the SW and NE naturals for Protoss. It seems you're pretty much forced to do a Ramp > Nexus walloff just because of how far forward the natural ramp is, plus having the double backdoor means walling off at the forward ramp would be even worse. At that point is it needed to have both of those ramps rocked off since you're already pretty much forced to wall in with your nexus? Maybe just having 1 rocked off? I guess it increases early game rush distance, but /shrug, just thinking out loud here. The funny thing is that if you had submitted only Foxtrot , instead of Kamala + Foxtrot , this map would have won TLMC with more than 50% votes imo. Lazyness 1 - 0 hard work. Can you try to export the zhakul'das texture ( the one with clowing cracks ) and modify the color from green to blue in photoshop ? Would be cool if you followed the color scheme of the pic you linked ^^. @Sidian When i was working on the map my original idea was to make the NE-SW bases have these long diagonal set of rocks with much more HP than usual and LoS blockers below blocking the ramp to the third AND the path to the natural mostly b/c i have wanted to use these sets of rocks in a natural for a while now but a tester of the map made me enter in reason, so i changed the layout. Regarding the space in the nat yeah it's awkward i must agree but that's because of blink stalkers, i must leave a good amount of space around the mains to avoid them, and that distorts the rest of the map, that's one of the reason why the mains are oversized, the second is that if a player decides to attack the rocks, the defensive player needs enough space so he can build a concave inside the nat to fend off the attack. Now as far as the rocks go, you can place a single photon cannon between them and you are able to fend off lings chipping away at them, so i don't see it being a very big problem. What i feel is out of place is the green iPistol ads. First, they're ads aren't they? Second, you already have a lot of green on this map. Maybe a dark yellow or a blue instead? Why are the asymmetric horizontal spawns allowed? Doesn't this give a clear imbalance? Bottom left has a small natural ramp to defend and bottom right has a similar ramp but it can be completely bypassed and the defender then cannot use a highground advantage. I really like every aspect of this map except this spawning possibility. It seems silly and an objectively wrong decision. On July 01 2014 05:44 MuadDib752 wrote:Doesn't this give a clear imbalance? Yes, the thing is that any rotational symmetric map is already imbalanced when spawning in horizontal or vertical positions, so if you have played in a 4p rotational symmetric map you have played in asymmetric map. As long as the map is well designed there isn't a issue with playing in a rotational asymmetric map, and if the outcry is just too big because of this, blizzard always can disable the spawns easily and the map becomes a 2in1 instead of being a 4in1. But i do agree with you, those spawns have been the focus of many players and discussions, at the end i decided to keep them because they are not particularly imbalanced or dull towards any race, but as i said i have no issues disabling them from the map, and as far as i know, blizzard is in the same train i'm. Are there spawn restrictions on Foxtrot Labs? The 3rd base is also so much farther by ground in the NW/SE positions than the opposite corner. I know there are tradeoffs, but it just doesn't seem necessary to include this spawn position for competitive play when the 2in1 version is quite good already. It always had this spawn configuration. Ahahaha yeah, i have gotten into some very interesting discussions about those spawns, the agreement is that even when the spawns are possibly broken, it is worth it just to see a meta develop from those spawns, i mean we as mapmakers are always trying new maps that are weird and/or funky so we can have more data and test new waters/new layouts.